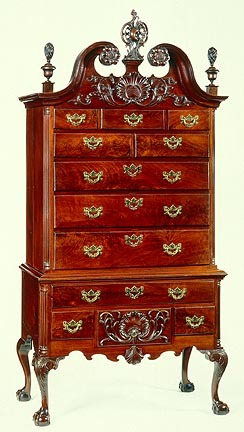 Philadelphia, High Chest of Drawers, 1760-75. Walnut, yellow poplar, white cedar, brass hardware (replaced), 94 1/2 x 46 3/4 x 23 3/4 in. Milwaukee Art Museum, Purchase, Virginia Booth Vogel Acquisition Fund, M1984.120. Photo by John Nienhuis. If you need an excuse for cake, Thomas Chippendale would have celebrated his 293rd birthday today. Indulge and then come to the Museum’s American Collections Galleries on the Lower Level and appreciate several sumptuous forms of “Chippendale” style furniture. Chippendale was born in England on June 5, 1718. He became a London cabinetmaker in the 1750s, and though his furniture appears in many grand 18th-century English homes, he is more widely known for publishing books on trendy furniture design. His publication was so influential that the name “Chippendale” stuck as shorthand for a wildly popular style of ornament. As an example, you can stand in front of the Museum’s High Chest and refer to it as either “Rococo” or “Chippendale” in style. 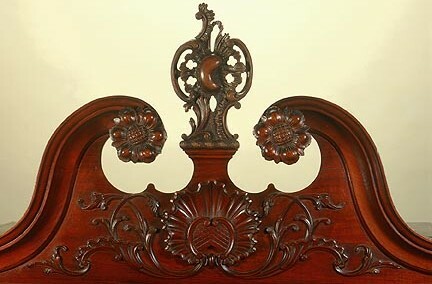 You’d be looking at an American object that Mr. Chippendale didn’t know about or help make, but your term would still be apt because its American craftsman knew about Chippendale’s ideas of good taste when he put together the exquisite carved ornament on this monumental object. In 1754, Thomas Chippendale published a hugely influential style guide titled The gentleman and cabinet-maker’s director: being a large collection of the most elegant and useful designs of household furniture in the Gothic, Chinese and modern taste. You can view all 160 of his copper plate engravings of furniture designed in the “modern” 18th-century taste—and, for that matter, see directly how the ornament relates to the Museum’s High Chest—in this complete scanned copy of Chippendale’s book on UW-Madison’s Digital Library for the Decorative Arts and Material Culture. Philadelphia, High Chest of Drawers (detail of bonnet), 1760-75. Walnut, yellow poplar, white cedar, brass hardware (replaced), 94 1/2 x 46 3/4 x 23 3/4 in. Milwaukee Art Museum, Purchase, Virginia Booth Vogel Acquisition Fund, M1984.120. Photo by John Nienhuis. The Museum’s High Chest was made in Philadelphia, one of the most rapidly growing American cities in the years leading up to the Revolutionary War. The city’s wealthy merchant elite demanded fashionable furnishings, fulfilled by immigrant craftsmen directly familiar with the most current British fashions. Or, perhaps, fulfilled by American craftsmen who kept current with style guides like The gentleman and cabinet-maker’s director . As one of the leading arbiters of taste, Thomas Chippendale himself was not inventing this ornament. We also call his style of furniture “Rococo” in design—a florid and often asymmetrical style that drew from many inspirations and affected all manner of artistic expression, from architecture and furniture to ceramics and paintings, like the Museum’s The Shepherdess by Fragonard. Rococo design also includes a hybrid adaptation of Chinese ornament called chinoiserie by the Europeans. This style of ornamentation developed out of a growing admiration for the beauty of Asian art and a curiosity about Chinese people and places—and in a way has never been out of style. The pervasive influence of chinoiserie will be explored at the Museum this summer in one of the five Summer of CHINA art exhibitions—Way of the Dragon: The Chinoiserie Style, 1710–1830 (June 30–November 6, 2011) in the Museum’s Decorative Arts Gallery. I’m particularly excited to see in that exhibition a small area that continues the story up to today, showing contemporary designs (tattoos? sneakers?) with this “exotic” frippery ornament. This entry was posted in Art, Curatorial and tagged 18th Century Art, American Art, chinoiserie, From the Collection, Furniture, Summer of CHINA. Bookmark the permalink.